Starting on the 12th September you can watch Joanna Lumley's latest adventure as she begins an epic 7,000 mile journey along the ancient Silk Road, travelling east from Venice to the Chinese border. Her route takes her through numerous countries including Albania, Georgia and Uzbekistan, revealing the diverse cultures, cuisines, architecture and innovations that the Silk Road helped spread across Asia and Europe. 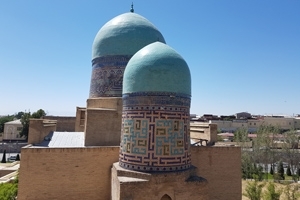 On her travels, Joanna sees traditional skills such as silk weaving and cheese making which have remained unchanged for centuries and also visits the fabled city of Samarkand in Uzbekistan with its magnificent Islamic mosques and mausoleums. In the second programme of the series, Joanna walks on the Transcaucasian Trail – a new trekking route that traces the ancient trading path through the beautiful and isolated Svaneti region of Georgia. If you are inspired by Joanna, take a look at our brand new trek: Svanenti & the Transcaucasian Trail, Georgia that visits several of the same villages as Joanna and also treks the most picturesque section of the new trail through Upper Svaneti. Joanna describes her odyssey along the Silk Road as her ‘most adventurous and exotic journey yet’ and if you would like to follow in Joanna’s footsteps, take a look at our Silk Road Tour that journeys from Tashkent, across steppe and desert to visit the three great Silk Road cities of Bukhara, Khiva and Samarkand. You can also watch our new video of this superb cultural tour and see the Silk Road brought to life. Joanna Lumley's Silk Road Adventure is a new four part series on ITV.